Amazon Simple Storage Service (Amazon S3) provides organizations with affordable and scalable cloud storage. Amazon S3 buckets can be pre-configured in GoAnywhere and then used as file repositories for trading partners. Workflows in GoAnywhere can also connect to Amazon S3 resources to upload, download and manage documents within various Tasks. Configuring Amazon S3 Resources (server connections) in GoAnywhere MFT saves time and provides additional security through separation of duties. After a resource is defined, a Project Designer can create a task and just refer to the Amazon Resource without needing to know the confidential login credentials. 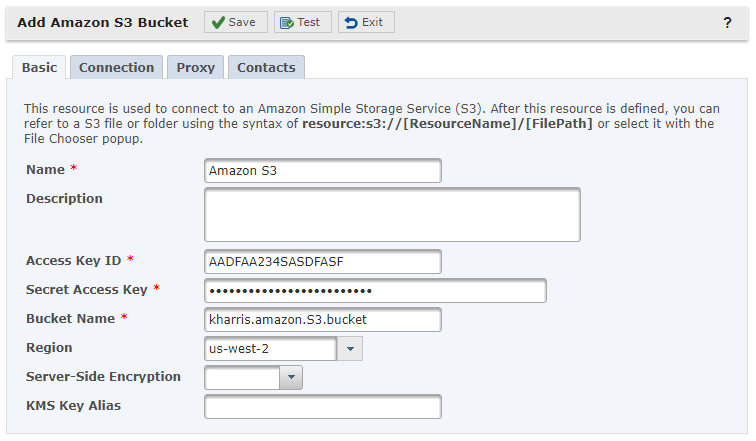 In the Amazon S3 Resource below, an administrator is creating a connection to an Amazon S3 bucket that can be used to automate transfers to and from the Amazon S3 Bucket. GoAnywhere MFT can connect to Amazon S3 compatible storage solutions like Ceph, Cleversafe, and Caringo. By specifying the Endpoint URL, GoAnywhere will use its Amazon S3 client to integrate with these compatible services. Request a quote to integrate with Amazon S3 buckets using GoAnywhere MFT.